If you haven’t been paying attention to the news, there’s a collard crisis underway. Not making this up. The cultivar Southerners crave this time of year is in serious short supply. Blame the elements. In the Southeast, too much rain has flooded fields. California collards are the victims of wildfires, either too much scarring from blowing ash or too much smoke to harvest ‘em. For me, none of this is particularly bad news. I hate collards. Every year I seem to find myself in the company of friends and/or family who want that traditional New Year’s Day meal of collards, cornbread, black-eyed peas and ham. Each of those foods supposedly represents something, though I have no idea what it is. 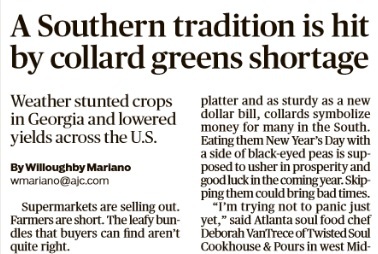 Except for collards. Because they’re green, I think they represent money. Eat collards on the first day and you’ll enjoy prosperity throughout the entire new year. I’d rather be poor. Collards taste nasty and give me gas. This is my own problem, I know. I’m a Southern boy with a Southern pedigree a mile long. Having grown up with considerable exposure to three sets of great-grandparents, I learned things kids today aren’t allowed to learn or are simply not exposed to. Another grandpa raised chickens and cows and plowed his garden behind a mule while grandma was making stew from the snapping turtle her brother had killed and brought into the house, swingin’ it by the tail. On my mom’s side, one great-grandfather was a preacher. A Baptist preacher. That’s an important Southern distinction. Wouldn’t be as meaningful if I had to identify him as Episcopalian. People might think we were drinkers. You know, whiskeypalians. And my elders did not drink. Had to learn to do that on my own. I’ve skinned and consumed a hundred rabbits and squirrels and gnawed clean their bones. I can pick out a ripe melon by thumping it. And I can fry you up a mess of okra that will absolutely make you weep. I shouldn’t have to prove my credentials as a Southerner, yet I’ve had a constant culinary clash with many of the foods beloved in the South. I don’t like boiled peanuts, either. Wait. Bad example. I’d definitely choose the fried chicken. And anything that taste like fried chicken. Frog legs, for example. Yum! But I love Italian food the most. I’ve wondered if the doctor who delivered me was Italian. Or maybe he had just polished off a pizza and the first breathe I drew on this earth was a whiff of his breathe. Adding insult to injury, the friend who prepares our collards every New Years Day is Italian. She claims what she cooks are Italian-style collards. I don’t fight it, but I don’t buy it. If I cook up a possum with pepperoni, does that make it Italian-style possum? Debate that while you eat your collards. If you can find any. Personally, I’m hoping to catch a break this year.